Not much going on aroud here. Makenzie si doing well. She was a bit gaggy and tight today but all in all it was a good day. Her PT came today and did a few things to her new chair today. She did great! Her head control is getting so good! We took a field trip to Sam's club today with the chair and she did well. It was so much easier not to have to hold her and push the cart while trying to pick out the groceries! The boys raced her around the store all the while she just giggled and smiled! She loves her brothers so much!! Tomorrow we are goingt to sit down with Child Find again tomorrow and continue to hash out Makenzie's IEP. Please pray that this goes well so that she can start school next month. Pray that we don't have to fight to get the enviornment and services that she deserves! Well that is about all for tonight. Keep praying! Prayer Works! "The LORD will fulfill [his purpose] for me; your love, O LORD, endures forever-- do not abandon the works of your hands." Thank you so much for your promise to fulfill your purpose for us. We thank you that your love and goodness to us endures forever, and we know that you will not abandon the works of your hands. 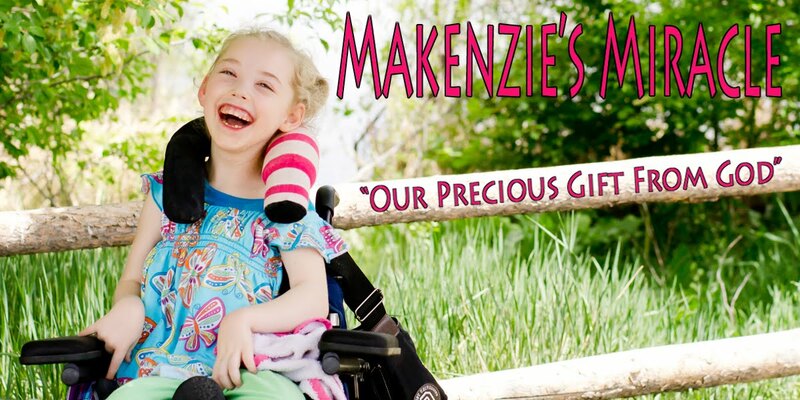 Father, in this day we especially bring Makenzie to you and we ask that you would visit her with a healing touch. Lord, we ask that you would bring new areas of healing in the following areas: to her brain, her digestive system, her arms to touch and hold, her legs to walk and run and her mouth to eat and talk. Father, we ask that you would bring new resolution to these specific issues. We thank you that your hand is upon her daily, and we ask that you will cause her to prosper greatly in days ahead.